Our breakfast was fabulous again today, with toast made using fresh bread from the motel bakery. One thing to be said for Newfoundland and Labrador, there’s a bakery almost everywhere, with excellent fresh bread. Today we continued heading south, which meant more headwinds. The road was also rather hilly. We crossed paths with our first cycle tourist in Newfoundland and Labrador today, which was very exciting! As we were ascending a hill, Ben came over to great us. He is from St. John’s and was heading up to his cottage in New-Wes-Valley. His claim to fame is a brief appearance in the current (September) Canadian Geographic Travel magazine. He has done a lot of cycle touring (across Canada and the US), and finds that Newfoundland is some of the most challenging riding, with lots of hills, constantly changing weather and high winds. Becky was feeling really tired today. She thinks her body is protesting too many hard days with headwinds. Scott was feeling better than her, but he was tired too, so we decided to call it a day a bit earlier than normal. 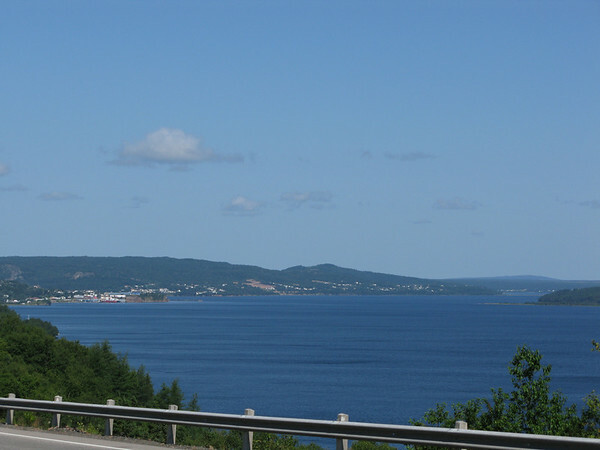 We stopped in Clarenville, the largest town we have been in since we left Goose Bay. It is actually big enough to have a Tim Horton’s and MacDonalds (neither of which we will visit – although we did stop at the Subway for our late lunch).